HOWEVER Customs treats Art just like any other commodity - and you have to get past Customs! BUT if you do it yourself - you are on your own! PLUS information on how to ship internationally and get it right is thin on the ground. ​This section aims to tell you what you need to know - and references other sources of information. The EORI Number - an identification number which customs use to identify the sender and their parcels across all EU countries. you have a specific customs or tax query which you can't find an answer to from official information available online. 1) I'm not liable for any of the advice you find on this page. - unless you employ a dedicated professional service to do it for you. Thank you so much for your informative, helpful blog. When I called shipping companies (4 times and a visit in person), no one would tell me where to get a Customs Declaration form which my new collector requires or even told me I could not get one until it was at customs. This was so frustrating and honestly, I do not think the people at the co. knew about the form or what is is and if they are answering questions about their international shipping service, they should. Thank you so much for Sharing your in depth knowledge on this! UNLESS YOU GET THE CUSTOMS PAPERWORK RIGHT! because the artist had failed to pay adequate attention to the processes and paperwork required for import and export. Similarly if you want your art back after sending it to another country, you need to send it with the correct documentation for re-import. Below I explain all the items that need to be included. ​Some of them are NOT optional. ​This is the export invoice that I use. Tax date: the date of the invoice. Client Order date / reference no. Commodity Code: This is ESSENTIAL. You won't get artwork past Customs quickly without this. Provenance: ​Recently I've been watching too many television programmes about establishing provenance! Plus I also saw some invoices recently for works sold by Paul Durand-Ruel in the nineteenth century and I was very impressed by the detailed description of the work. ​Hence I have now added this into the invoice I use! weight and nature of the packaging. You should attach an invoice for all commercial items. ​I recommend two EXPORT invoices - one in the plastic envelope on the outside and one on the inside of the package - in case the external envelope gets detached after the package has arrived at its destination country and made it out of customs. Plus - for a return journey - an Import Invoice for return to your studio within a Customs defined period - generally under two years (eg coming back from an exhibition; a dissatisfied customer etc) to claim relief from payment of import duty. Fail to use the right code and your package can get stuck in Customs! The Harmonized Commodity Description and Coding System has been developed by the World Customs Organization to help speed up parcels and packages through Customs - and you MUST use the correct commodity code. 200+ member countries use this system - but not all countries do. The images below relate to this code classification model to ART as detailed on the UK Government website. 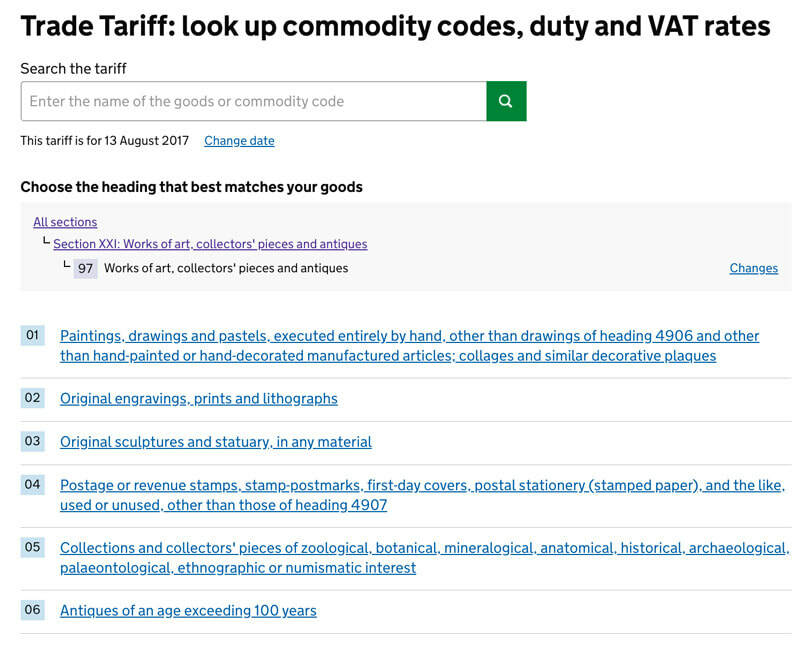 Listing relevant to art in the "Trade Tariff: look up commodity codes, duty and VAT rates"
When is art not art for the purposes of commodity codes? Do make sure you pay close attention to what is and is not defined as artwork! What is Art? | Taxation is a summary of an important case where HMRC had asserted that an installation when disassembled for transport was not art. However it was trying to charge VAT at the higher rate but on the value of the artwork as opposed to the value of the materials which comprised the installation. If you live in the EU, you need an EORI number to trade goods with countries outside the EU. When any why do you need an EORI number? You need an EORI number to trade goods with countries outside the EU. If you’re based outside the EU you need an EORI number to trade goods with the UK. "EORI" stands for Economic Operator Registration and Identification. An EORI number is a unique identification number which identifies who you are to Customs. UK EORI numbers start with the letters 'GB'. Most are then followed by a 12-digit number based on the trader's VAT number (eg GB123456789000). When and why do you need an EORI number? If you live/work within the EU you need an Economic Operator Registration and Identification (EORI) number to trade goods with countries outside the EU. For example, in the UK, HM Revenue & Customs (HMRC) assigns an EORI number to importers and exporters. If you live outside the EU you should request an EORI number from the customs authorities of the EU country responsible for the place where the artwork arrives first. New Rule on Cargo Is Shaking Art World | New York Times - what happens when the Transportation Security Administration mandates all items shipped as cargo on commercial passenger airplanes has to go through airline security screening. You cannot assume no duty or tax is payable at Customs. Charges are based on the VALUE of the art. Valuing art is usually based on sale prices for similar works. The country that imports the art gets to set the rules as to which duty and taxes apply and what rates they will use. There is a global crackdown on e-traders and others deliberately mispricing goods in order to avoid tax. declare an item to be a gift when it is not. So, for example, that fact that a commissioned artwork might be a gift from a husband to his wife does NOT make it a gift in terms of the value of the item and the sum you have received for the commission. When are goods exempt from tax? In many countries, overseas goods are free from customs duty or import value-added tax if they are personal gifts for special events, like weddings or birthdays. To benefit from the relief, the goods must typically be worth less than $50. ​(unless none is payable e.g. artist in EU country sells to collector in a different EU Country). ​The principle is that the buyer pays all relevant duty and tax - because the amount that is payable is dictated by where he or she lives and what gets charged when importing art to that country. If your work is available for sale to anybody living anywhere in the world, you MUST state that the prices of art on your website (or third party site) are subject to the addition of any relevant duty and taxes on exporting permanently outside your country and importing to another. Notices about how this works in your country will vary. In the UK Notice 236 Returned Goods Relief details how this works (note also this gets updated on a periodic basis so be sure to click the link to make sure you are working with the latest version. See below for how this applies to artwork re-imported after an exhibition in another country within 2 years - it's one aspect which makes life a lot simpler! Within the EU, unless an exemption applies, the importer of art, antiques and collectibles is liable to pay import VAT at the rate determined by individual countries. If you are re-importing art after an exhibition - see Liability for duty and tax on art re-imported after an exhibition below. VAT for non-UK artists and UK exhibition organisers | Making A Mark - an introduction to recent changes in Value Added Tax and VAT registration for both artists living outside the UK who want to exhibit and sell their art in the UK; and those selling art by overseas artists in the UK i.e. the managers of art galleries and art fairs, the Executive Committees of Art Societies and the organisers of Art Competitions. Countries tend to have trade agreements which mean at least some goods imported from some countries are charged a lower tariff. These agreements tend to be reciprocal rather than one way. You can look up tariffs for the fine art commodity codes using the World Trade Organisation's Tariff Download Facility - this indicates those with a significant duty on imported art. The Scribd document provides the Section Headings of the Harmonized System. Your goods will not be released by customs until you’ve paid all duty and UK VAT. Duty relief schemes - temporary admission scheme. If you are importing artworks for an exhibition they are subject to duty and VAT relief - as long as they are exported within 2 years. - original paintings, sculptures and engravings. Within the EU, the standard rate of VAT varies between 15% and 25%. In some EU countries, a reduced rate of import VAT applies. The reduced rate varies by EU country between 5% and 18%. If you lower the valuation of art intended for sale on the entry documents - in order to avoid tax - you are committing a felony. In order to ship merchandise into the US, customs requires the owner of record to have a US Federal Tax ID number (also known as an Employer ID #) with a US mailing address. An informal entry is the entry of goods valued under 2500US$ and does not need to be cleared by a customs bond as it is designated for mostly personal importations. What do I need to know about exhibiting a product, bringing or shipping supplies for a Trade Show in the U.S.? · Complete CBP 7523 "Entry and Manifest of Merchandise Free of Duty" (For NAFTA items only). If shipping supplies and/or the value is over $2500, aTEMPORARY IMPORTATION UNDER BOND (TIB) orCARNET is the best course of action. This applies to display booths or other items not remaining in the U.S. beyond your intended visit. Non-established taxable persons (known as NETPs e.g.international artists who do not live in the EU) who are IMPORTING art for sale at art exhibitions (for art competitions or otherwise) in the EU need to know about VAT and how it works. Artists without a UK residence must register for UK VAT and supply a UK VAT number before they can sell works of art in an art exhibition or art gallery in the UK. MUST PAY 5% VAT to Customs & Excise at the border. In principle this means they have to register for VAT with HM Customs and Excise (can take up to 4 weeks) prior to importing the art. Relief from customs charges can be available if it is purely exported for exhibition and then re-imported unchanged by the artist - but there is a time limit on how long the art can be out of the country. If you are importing artworks for an exhibition they are subject to duty and VAT relief as long as they are exported within 2 years. In brief and in summary (and without liability) "exhibits for galleries or museums" are eligible for relief from duty if reimported without alteration after an exhibition. 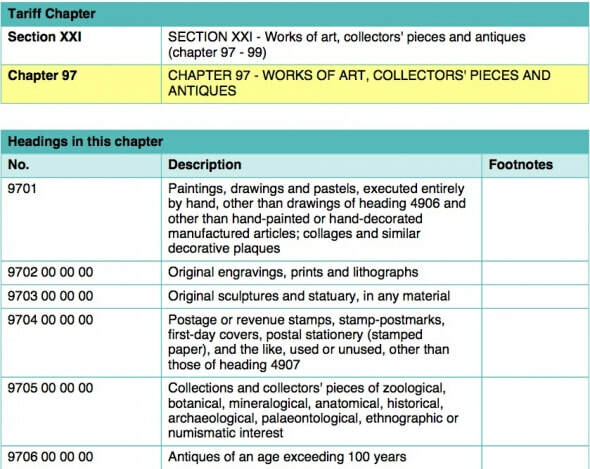 You can defer duty and tax on artwork sent to an exhibition (ie temporarily exported). However it becomes liable for tax if sold (and hence permanently exported). The goods must be re-imported in an unaltered state, apart from any work that may have been required to maintain the goods in working order. Any work done must not have upgraded the goods to a higher specification or increased their value. ​This explains how to re-import commercial goods to the EU and obtain total or partial relief from customs duty, VAT and CAP charges. Customs authorities around the world require international mail and parcels of value arriving in their country to have the required customs declarations. So make sure you've completed the necessary forms. For all commercial items you MUST also include the trade commodity tariff code and the country of origin of the goods (artwork). CN23 is for artwork valued at over £270. It requires a lot more information. The information required is as followed. General descriptions are not permitted. Give a detailed description of each article in the item, e.g. “framed oil painting”. Give the quantity of each article and the unit of measurement used. Give the net weight of each article (in kg). Give the total weight of the item (in kg), including packaging, which corresponds to the weight used to calculate the postage. Give the total value of all artwork in the package - indicating the currency used (e.g. GBP for pounds sterling). HS tariff number (6-digit) must be based on the Harmonized Commodity Description and Coding System developed by the World Customs Organization. The “Country of origin” means the country where the goods originated, e.g. were produced/manufactured or assembled. Senders of commercial items are advised to supply this information as it will assist Customs in processing the items. Give the amount of postage paid to the Post for the item. Specify separately any other charges, e.g. insurance. Tick the box or boxes specifying the category of item. Provide details if the contents are subject to quarantine (plant, animal, food products, etc.) or other restrictions. (Certificate) If your item is accompanied by a licence or a certificate, tick the appropriate box and state the number. (Invoice) You should attach an invoice for all commercial items. Your signature and the date confirm your liability for the item. 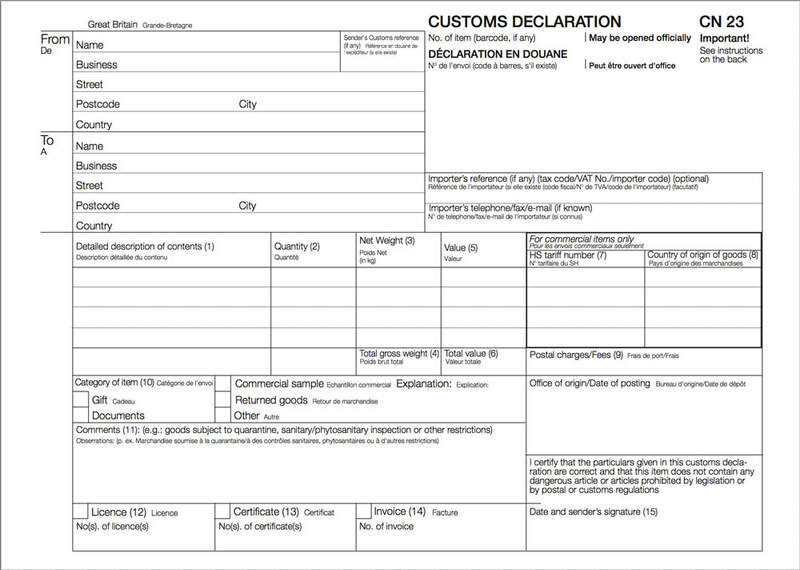 ​Any item sent with a value in excess of £270 must have a fully completed Customs declaration form CN23. This should be attached using the plastic wallet available from any Post Office® branch. Actual Usable Inner Dimesnions: 6" x 9" - Actual Outer Dimensions: 6 5/8" x 10". This envelope can be used to include your CN23 and any other relevant documentation which Customs need to see. Protected by a very strong adhesive seal to keep documents secure during transport and in all types of weather. The ATA Carnet is used for artwork being shipped for exhibition only. 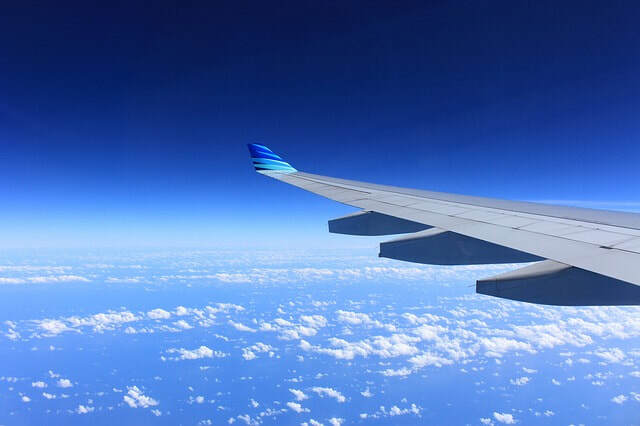 The ATA carnet is an international Customs document that can be used in different countries around the world to cover temporary use of goods without payment of Customs charges." "Works of art, collectors items and antiques imported for the purposes of exhibition, with a view to possible sale"
A carnet can be used by private travellers or businesses. When a carnet is issued, the person who can use it will be named on the front cover of the carnet, this person is the ‘holder’. The carnet can be used by the holder or a representative. The representative is named in box B of the carnet or by a letter of authorisation. cover transit of goods through certain countries en route to countries where they will be temporarily used. However they can be quite difficult to obtain and they are not essential if you do the paperwork for Customs properly. ATA Carnet - Wikipedia, the free encyclopedia - ​The ATA Carnet is an international customs document that allows the holder to temporarily (up to one year) import goods without payment of normally applicable duties and taxes, including value-added taxes. The Carnet eliminates the need to purchase temporary import bonds. So long as the goods are re-exported within the allotted time frame, no duties or taxes are due. ATA Carnet | Trust the Experts - Detailed information, Alerts and Updates about the ATA Carnet international customs document is found on these pages. Live Customer Service from Carnet Specialists is also available using Click to Chat and Click to Call. Business support, information and advice | Business Link - Export Procedures - ATA and CPD (Carnet de Passages en Douane) - ​ATA and CPD (Carnet de Passages en Douane) carnets provide for goods to be taken temporarily into or out of the European Union (EU) for purposes such as exhibiting at a trade fair without having to complete the customs declarations and formalities normally required. Their use is not mandatory but where they are available they simplify customs clearances in dispatching and receiving countries that are party to the ATA carnet or Istanbul Conventions. No specific documentation is required if importing and exporting where the art remains within the EU. The 28 EC countries are: Austria, Belgium, Bulgaria, Croatia, Republic of Cyprus, Czech Republic, Denmark, Estonia, Finland, France, Germany, Greece, Hungary, Ireland, Italy, Latvia, Lithuania, Luxembourg, Malta, Netherlands, Poland, Portugal, Romania, Slovakia, Slovenia, Spain, Sweden and the UK. You do however need documentation when exporting from within the EU to e.g. the USA and other countries around the world. Failure to use proper documentation completed in full will mean the package being returned or getting stuck in Customs. "When sending packets or parcels outside the EU, you need to make sure that it is presented with the right forms. If you don't, it's likely it'll be returned by the destination country's customs service." All items with contents up to the value of £270 must have a signed and dated Customs declaration form CN22 attached to the front. "A PS Form 2976, Customs Declaration CN22 - Sender's Declaration, must be used on all First-Class Mail International® package-size items (small packets), the Priority Mail International® Small Flat Rate Box, M-bags, and certain Express Mail International® items. Refer to the International Mail Manual at pe.usps.com for additional information. "Examples of items that do not qualify as documents - rather, they are considered merchandise, so the sender is required to apply a customs declaration form and declare a value"
USPS - Customs Forms International shipments may be subject to Customs examination in the destination country. Sign in or sign up to complete Customs forms online to declare the contents and value of your shipment, or just select and print an online Customs forms. You may need a licence to export certain ‘cultural goods’ over 50 years old. Whether you need a licence depends on the age and value of the goods - see the tabulation below for the values for different commodities used by the EU. Certain cultural goods that reach or exceed specific age and monetary value thresholds require an individual licence for export out of the UK – whether on a permanent or temporary basis. 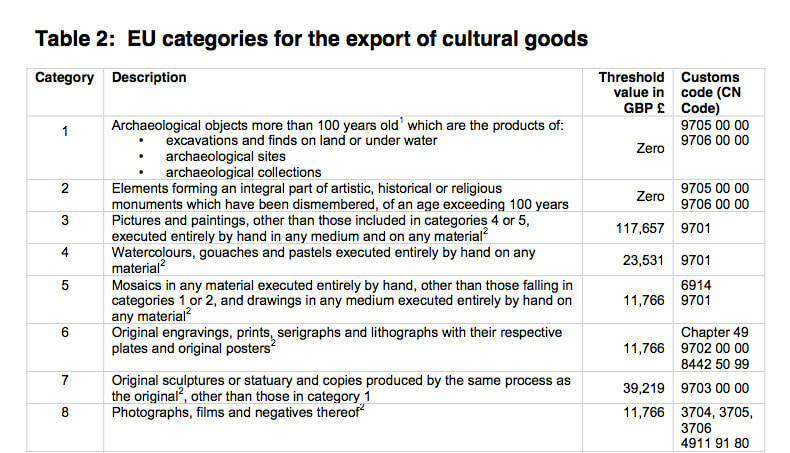 The provision of provenance by exporters for cultural objects that are intended for export, would appear to be a recurrent, contentious, and on occasions fractious issue for quite some time. The Export Licensing Unit of the Arts Council issues export licences on behalf of the Secretary of State in the UK. The British Government seeks to keep items of particular cultural significance in the UK. Consequently there are export controls on art and other significant items. These are the rules. They're not negotiable. Export art, antiques and cultural goods: special rules | GOV.UK - How to apply for a licence to export cultural goods, including antiques, furniture and archaeological items. Export Licensing | Arts Council (UK) - - provides information and guidance about export licences. Certain cultural goods that reach or exceed specific age and monetary value thresholds require an individual licence for export out of the UK – whether on a permanent or temporary basis. Export Licences | Antique Trades Gazette - When art and antiques are bought and sold above certain the value thresholds, it is necessary to obtain licences to export these items from the UK. USE CAPITALS FOR ADDRESSES - it avoids confusion due to handwriting. USPS - International Resource Center - Find all the shipping resources you need for your international business. USPS - International Shipping Instructions - ​Follow our instructions to ensure your mail is correctly packaged. USPS - Addressing International Mail - Be sure your mail gets there-see how to address it correctly. Information is available as to what restrictions and prohibitions are employed by Royal Mail and Parcel Force within the UK and for international post. Bear in mind prohibitions on what can be sent internationally tends to be identical across the world. Royal Mail guidance on weight and size restrictions when sending international items of mail. | Royal Mail Group Ltd - Here are the minimum size and weight restrictions for all Royal Mail's international services.